"Happy Feet Two" returns us to the frozen arctic on the heels of the Academy Award winning "Happy Feet" (2006). A worthy successor, the film itself is a delight for children and adults alike with several musical numbers, a positive message of working together, and good old fashioned family fun. With several package options to choose from including Blu-ray 3d combo pack, Blu-ray combo pack, DVD and digital download you'll be sure to find your happy medium to watch the film as you want to enjoy it. Elijah Wood ("The Lord Of The rings") returns as the voice of the emperor penguin Mumble, who's happy tapping feet famously grace the title. His son, Erik (relative newcomer, Ava Acres) who similarly is having trouble finding his way among the anonymity of the penguin rookery, decides to go off on his own to explore the arctic landscape. Its here Erik meets Sven (Hank Azaria "The Birdcage"), an odd looking penguin with a unique and seemingly preposterous ability to fly. Sven becomes a hero to Erik, much to the lament of Mumble who decides its best to let his son find his path rather than try to force his ways in. Things begin to get troublesome when, as foreshadowed in the opening credits, the earth begins to move and traps the penguin empire behind a glacier unable to escape or find food. When Sven is revealed as less than the heroic penguin he makes himself out to be, Mumble takes it upon himself to bring together many species of the Arctic to work for a solution to free the penguins and save the day. Erik find a new respect for his father, and his own unique talents, as the events unfold. With an all-star cast the voice acting in the film really shines. Robin Williams ("Good Will Hunting") returns as the charismatic Ramon and larger than life Lovelace. A surprise comedy duo of Bill and Will The Krill (tiny shrimp like creatures) Matt Damon ("Good Will Hunting") and Brad Pitt ("The Curious Case Of Benjamin Button") bring the laughs and seem to having fun with their uncharacteristic roles as the little guy. As with the original Happy Feet, the musical song and dance numbers stand out as inspired, with top musical talent (Pink, Common, Lil' P-Nut) lending their voices to up the production quality. The final solo operatic performance by Erik, where he finds his true voice, is memorable and truly one to behold. At times , however, if feels as though some musical scenes are shoe horned in to get the same "feeling" back as the original Happy Feet. This is the kind of film Blu-ray was made for. With sharp contrasts in color with the beautiful majestic arctic landscape and sleek black penguins the detail in the 3D textures pop off the screen. With so many rhythmic musical numbers to enjoy the DTS-HD Master Audio 5.1 surround will fill your home theater speakers with an above average auditory experience. Perhaps the most interesting feature of the Blu ray is the optional "Second Screen" which becomes available on your iOS device. By going to the iTunes app store and downloading the "Happy Feet Two Movie App" using you iPhone, iPad, or iPod touch your viewing experience is made even better. By syncing with wi-fi to your Blu ray player you can follow along with the film and expand your viewing experience. The app also includes sing-alongs, a dancing penguin game and a coloring book. The Blu-ray experience truly has family at the heart of its special features. For the aspiring scientist or nature lover in your family, the Blu-ray offers a trip through the Arctic with Lil P-Nut (who plays the hip friend of Eric "Atticus") Here your child is treated to fun and interesting facts about Antarctica including the habitats of whales, krill penguin and more. They are sure to have questions after seeing how nature plays out within the film and this Blu ray feature gives them the ability to learn more. For your would be American Idol, Pink , who sings many of the songs in the film, gives an inspired take on creating and singing the songs of the film. There is also a feature which teaches the artist in your family exactly how to draw and animate their own penguin character. A family film in the truest sense of the phrase, Happy Feet Two flawlessly brings together many of the things that make for a great family viewing experience in one solid package. Buy it 3.13.12 on Blu-Ray Combo Pack with UltraViolet Digital Copy and Download to own. Your feet won't be the only happy thing that you did. Download Happy Feet 2 from the iTunes Store in Digial HD. 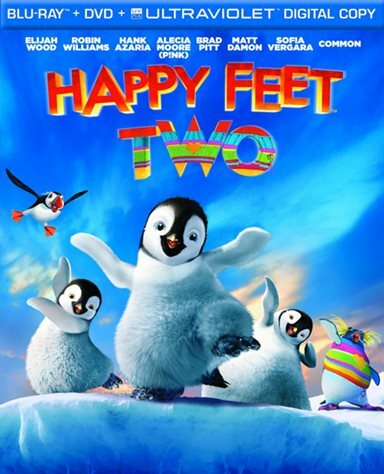 For more information about Happy Feet 2 visit the FlickDirect Movie Database.